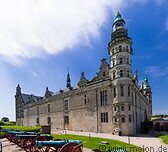 Kronborg is a Danish renessaince fortress located at the outskirts of Helsingør, which in the past controlled the Øresund strait at its narrowest point. The castle was initially built in 1420 by king Eric of Pomerania, and expanded or rebuilt a number of times until the 20th century. Today the castle is no longer used for military purposes and is open for the public. The Kronborg castle has been a UNESCO world heritage site since the year 2000. Despite claims that it is one of the most important Renaissance castles in Northern Europe, the castle itself is not too impressive from an architectural point of view.